Mountain biking is a great sport filled with plenty of adrenalin pumping action. Whether you are an expert / pro mountain biker or just out for some exercise on the weekends one of the most important pieces of biking gear is a good pair of sunglasses. A good sunglass may improve the contrast on the terrain allowing you to miss the large rut on that wide open downhill. A good pair of sunglasses may also protect your eye from the potential impact of a tree branch that could cause a very painful corneal abrasion or even a vision threatening retinal detachment. A good pair of sunglasses may also eliminate the possibility of developing a solar keratopathy (sunburn to your cornea). So you can see that the proper sunglass will not only improve visual performance but will also protect your eyes form the harmful suns rays and potential trauma. After purchasing your new mountain bike and helmet you need to invest in a good name brand pair of sunglasses like Oakley, Bolle , Costa Del Mar or Nike. These are all great sunglasses with a variety of lenses and frame designs. You will need plastic impact resistant lenses and stay away form glass lenses. I do not recommend polarized lenses for any type of biking. Polarized lenses will not give you enough contrast when you are riding in the shade, early morning or evening. Polarized lenses are terrible for the road biker because they miss the oil slick on the road because the glare was blocked by the lenses. Polarized lenses are a must for boating or fishing but a never for any type of biking activity. One of my favorite sunglasses for mountain biking is the Oakley Radar Path with the VR 28 Black iridium lens. These sunglasses are designed to improve airflow over your face for cooling and have interchangeable lenses and nose pieces for fine tuning performance. The VR-28 black iridium lens is a super high contrast lens that blocks UV and HIV (blue light) making it a lens that may reduce your risk of developing certain eye diseases like cataracts and macular degeneration. The lens is also made of an impact resistant material called Plutonite. One of the hottest new technologies available for the mountain biker is the Bolle Traverse sunglass with the rose modulator lens. This is a lens that is a high contrast rose for dim and shade conditions that will become a darker grey color out on in the direct sunlight. This is becoming very popular for competitive and recreational bikers. If you want some serious contrast for reading the terrain in those very technical areas while mountain biking then get the Bolle 100 Gun lens. One of the newest lens technologies for mountain biking is the Nike Max Hi- Vis Tint. This is the latest being offered by Nike that actually filters out colors that can be visually distracting and increases contrast by transmitting more yellow. This is a favorite among many of my competitive Mountain Bikers. Nike has a variety of frame styles with this lens. The Nike Max Hi-Vis Tint is great for early morning, late evening, under the canopy of trees or in direct sunlight at 12 noon. Express Sunglasses ( www.expresssunglasses.com )	has been custom making lens and frame combinations for mountain bikers for over ten years. They have also sponsored numerous mountain biking teams throughout the years. Many of the staff at Express Sunglasses are avid mountain bikers wearing custom designed lenses fabricated by the lab at Express Sunglasses. I have worked very closely with the master opticians in the lab at Express Sunglasses to help create a super high contrast lens that can be worn in early low light conditions which will then darken significantly in much brighter conditions. These lenses come in two initial colors of yellow and orange. These lenses will darken to a dark amber and dark orange in the bright sun. Both lenses block 100% of the UV light and block close to 100% of the HIV blue light as well. These lenses can be put in almost any frame with almost any prescription, single vision, bifocal or progressive lens technology. These lenses solve the problem for the avid mountain biker that needs a prescription to see clearly in all conditions while biking. The lenses will adjust accordingly to the amount of light that is available, so while you are under the canopy of oak trees your sunglasses have adjusted to less sun and allowed you super high contrast and sharp acuity while your competitor may be having difficulty with the terrain because of the dark lenses he / she is wearing. These two custom lenses are also great for shooters, hunters and golfers. Express Sunglasses can be reached by calling 1-877-808-2020 or faxing 1-877-606-2020. You can purchase your sunglasses at a discounted rate at www.expresssunglasses.com, you always receive great customer service, free shipping and a free pair of sunglasses from select group when purchasing a name brand. I like to recommend www.expresssunglasses.com because of their great service, years of experience in research and fabrication of sunglasses and the added value you get everytime you purchase a sunglass from them. Yes that is correct, every time you purchase a sunglass at Express Sunglasses you will receive a free sunglass from a select grouping. Check out MS-14 under the free sunglasses, it is a great sunglass for mountain biking and its free! Enjoy the single track and be careful on the downhills!!! Shop for all of your sunglass needs at www.expresssunglasses.com. 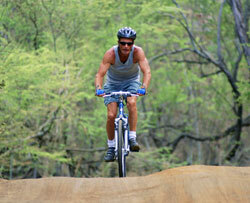 Dr. Lange has been involved in Mountain biking and road biking since the early 80's.